Citation Information: J Clin Invest. 2019;129(3):1061-1075. https://doi.org/10.1172/JCI99296. Atypical hemolytic uremic syndrome (aHUS) is frequently associated in humans with loss-of-function mutations in complement-regulating proteins or gain-of-function mutations in complement-activating proteins. Thus, aHUS provides an archetypal complement-mediated disease with which to model new therapeutic strategies and treatments. Herein, we show that, when transferred to mice, an aHUS-associated gain-of-function change (D1115N) to the complement-activation protein C3 results in aHUS. Homozygous C3 p.D1115N (C3KI) mice developed spontaneous chronic thrombotic microangiopathy together with hematuria, thrombocytopenia, elevated creatinine, and evidence of hemolysis. Mice with active disease had reduced plasma C3 with C3 fragment and C9 deposition within the kidney. 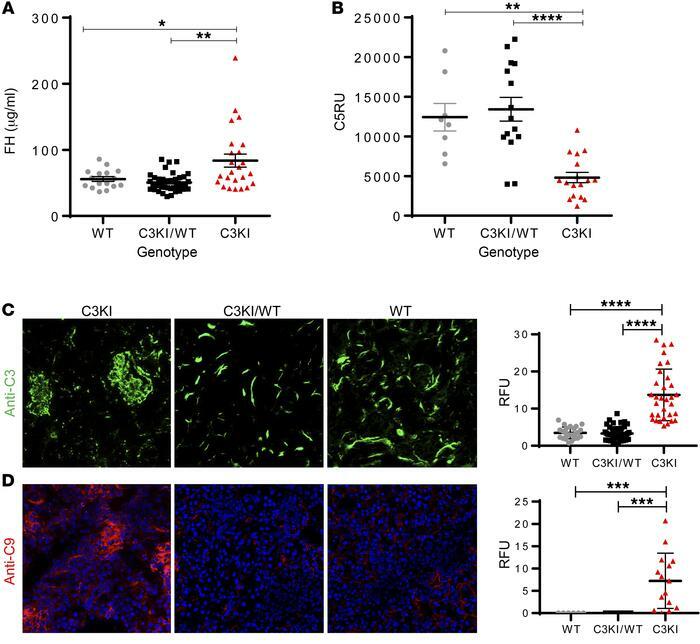 Therapeutic blockade or genetic deletion of C5, a protein downstream of C3 in the complement cascade, protected homozygous C3KI mice from thrombotic microangiopathy and aHUS. Thus, our data provide in vivo modeling evidence that gain-of-function changes in complement C3 drive aHUS. They also show that long-term C5 deficiency is not accompanied by development of other renal complications (such as C3 glomerulopathy) despite sustained dysregulation of C3. Our results suggest that this preclinical model will allow testing of novel complement inhibitors with the aim of developing precisely targeted therapeutics that could have application in many complement-mediated diseases. Complement dysregulation in C3KI mice. (A) Complement FH levels in mouse plasma isolated from 19 C3KI mice (triangles), 34 C3KI/WT (squares), and 19 WT (circle) mice, P14–28, were established using an in-house sandwich ELISA described in Methods. (B) C5 levels in mouse plasma isolated from 17 C3KI, 15 C3KI/WT, and 8 WT mice on P14–P28 were established using an in-house sandwich ELISA. Relative units were generated via a standard curve based on WT control serum. (C) Immunofluorescence of glomerular C3 deposition in C3KI, C3KI/WT, and WT kidneys (representative of n = 10 in each group). Images were taken on a Zeiss Axio Imager II. Original magnification, ×20. Densitometry analysis is shown to the right of the panels; relative fluorescence units from >25 image captures are indicated. (D) Glomerular C9 deposition in C3KI in comparison to background staining of WT. Original magnification ×20; >6 image captures shown in densitometry. *P < 0.05, **P < 0.005, ***P < 0.001, ****P < 0.0001 using unpaired t test with Welch’s correction.